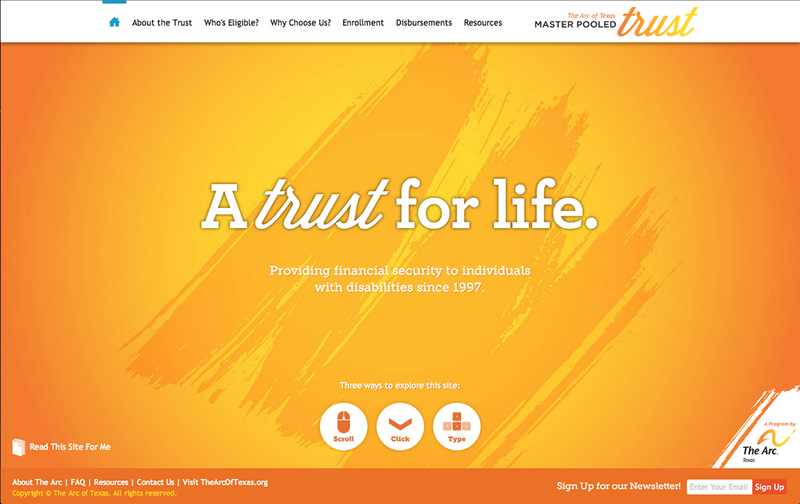 The Arc of Texas Master Pooled Trust is a Texas-based Special Needs Trust for Texans with intellectual and developmental disabilities. Their One Pager is packed with information but really well thought out with an impressive navigation. Using CSS3 and jQuery, I tried to created an beautiful and easily accessible single-page scrolling site that incorporates some of the latest trends in web design, such as hints of parallax scrolling, large fixed background images, a sticky header and side navigation (powered by jQuery Wayfinder) and some custom icons and illustrations.